Well kids. It’s like summer today. Sunny and 80! Slight breeze! The PERFECT day for a Kabob Party! We are off to a friends house for the first (of many) kabob parties this year! Each family brings something different to put on the skewers and a side dish! This way you get a tasty variety without one person having to bear the brunt of the cost of the party. What is your favorite kabob add on? Or favorite kabob combination? We love sirloin steak marinaded in italian dressing and soy sauce on skewers with pineapple chunks. We usually serve it with some extra italian dressing on top of brown rice. So good and instantly puts me in the mood for summer. yum! I love pineapple and mushrooms! Easy. Chicken, Pineapple, and Onion is my favorite combonation. I don’t know why I like it so much. But it does seem that food tastes that much better when eaten off a stick! Mmmmm – Kabobs. I really like to put mushrooms, onions, squash, zucchini, and chicken on mine. I’m just about to purchase some metal skewers though as I always seem to burn the wood ones to the point where the goodies are about to fall off and it’s difficult to flip the dang things. Mmm… a Kabob party sounds like a great idea to me ~ yum! I love the idea of a kabob party! Thanks for sharing. I like pineapple chunks with marinated teriyaki chicken chunks! I love pineapple on my kabobs! We typically do onion, mushrooms, bell peppers, pineapple, and meat. Yummo! We love red onions because they get so sweet when grilled. But my microbiologist training makes it impossible for me to put meat & veggies on same skewer. I’m always paranoid the meat will still be raw and salmonella-inducing while the veggies char. We do all meat & all veg and stagger the start times. Perfection! Marinated artichokes! Use the artichoke marinade as the marinade for chicken kabobs, and put the artichokes on the skewers – yum! I love mixing pineapple chunks in with my kabobs. My favorite skewer combo is pork tenderloin, apricot and red onions. So tasty! What a smart idea! Love it! I like grilled pinapples with chicken! Those kabobs look scrumptious! kabobbing is our favorite grill “technique” of the summer, and it’s SO easy. We use Italian dressing to marinate the meat and veg, make more than we can actually consume, then the leftovers are incredible the next day for lunch in a salad with field or spring greens – yum!!! I marinate my chicken with italian dressing, a little white wine vinegar and a dash or two of poultry seasoning. It’s really the perfect marinade for any chicken. I also add mushrooms, ANY colored pepper (it really makes it a colorful dish! ), onion and pineapple. I like to serve it over brown rice. LOVE the idea Erin! How do you make sure you get a variety (no repeats)? Do you tell people what to bring? Yes. It would take a little coordination…you bring the chicken and red peppers, you bring beef and green peppers, you bring shrimp and onions, etc. i love little baby tomatoes! particularly if i use all the dead-headed basil on the grilll (the flowers — let them dry out, then toss them on the grill. inhale). 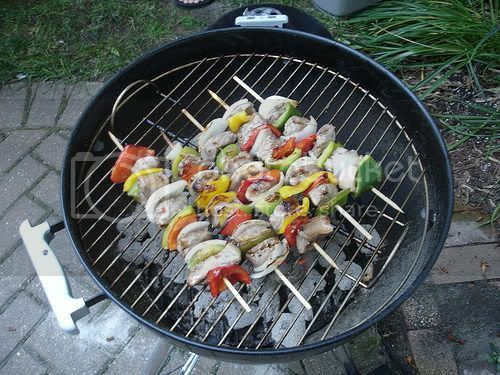 we use 2 skewers per kabob, much easier to turn stuff and grill both sides. What a great idea…gonna have to give it a go this summer! ahh the humble kebob….rather kabab. gift to us from the middle east. My fav muslim food. I love chicken, red onion, green peppers and a great marinade. I’m glad there’s coordination! One time I went to a summer gathering and 3 out of 5 families brought the same side dish – green bean casserole! LOL My family does beef and pineapple kabobs and we love them to death. Yum!!! Kabobs!!!! We love marinated steak+imitation crab+green peppers+ onions+mushrooms!